It measured up to 100ft from nose to tail. It weighed up to 80 tonnes. It was one of the biggest animals to walk the Earth. And it died in a shallow tidal channel in a mangrove swamp 94m years ago.Paralatitan stromeri - the first word means tidal giant - is a new species of titanosaurid or gigantic dinosaur, discovered at an Egyptian oasis and reported in the US journal Science today. 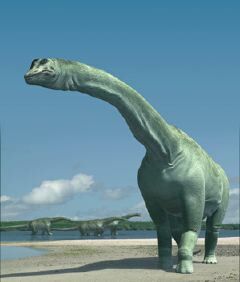 It is also the first fruits of a rediscovery of what some scientists have dubbed "dinosaur heaven". Nobody knows why Paralatitan died. It was a titanic vegetarian, enjoying the rich pickings of what must have been one of the most fertile habitats on the planet. But as it lay dead, the tide lapped around the decaying carcass. A carnivorous scavenger picked over some of the bones, ripping apart the pelvis - and possibly leaving a tooth behind in the process. Then the waters of the lagoon closed over the body and its mud buried the remains. Millions of years passed. The coast moved further north, leaving Paralatitan covered by deep dunes. Dinosaurs came and went, and 60m years ago, departed altogether. Paralatitan's grave became what is now the western desert of Egypt. Egyptian civilisation flourished and waned. The Romans came, the Arab forces of Islam came and then British and German troops fought for control of the desert. Last year, a University of Pennsylvania team, led by doctoral student, Joshua Smith, and backed by a film company, took a closer look at the sands of the Bahariya oasis, south-west of Cairo. They discovered abundant fossil plant remains. They found fossils of fish, crabs, the coelacanth, and crocodile-like species. And then they found an arm bone. The humerus, or upper arm of Paralatitan, is 1.69 metres long - a seventh as big again as any bone ever found from the Cretaceous era. From the remains, researchers were able to reconstruct a long-necked, long tailed plant eater of unprecedented size. Among the bones of Paralatitan, the researchers found the tooth of the great African carnivore Carcharadontosaurus. The guess is that the killer may have lost a fang while mauling the bones of the giant vegetarian. It became clear that the scientists had stumbled on an unusually rich site - a fossil landscape that told of colossal plant growth, teeming with plant-eaters and their predators. Details of earlier excavations, stored in a Munich museum, were destroyed when it was bombed during the second world war. Mr Smith said: "We may have stumbled on dinosaur heaven at Bahariya." As part of his doctoral thesis, Joshua Smith of the University of Pennsylvania set out to rediscover the lost dinosaurs of Ernst Stromer, the German palaeontologist who explored Egypt early in the 20th century. But though Stromer had described his sites, he had left no maps. Mr Smith set off and by mistake entered the wrong coordinates in his GPS satellite system. To orient himself, he looked out of his land cruiser window - and immediately saw a large dinosaur bone. "It was total serendipity," he told Science magazine. The find puts Africa firmly back on the map for the dinosaur hunters, and is further evidence that researchers may not have been looking hard enough. Paleontologists working in Egypt's Bahariya Oasis, some 180 miles southwest of Cairo, have unearthed the remains of one of the largest dinosaurs yet discovered, according to findings reported today in the journal Science. The team estimates that the new beast, which they have named Paralititan stromeri, measured around 90 to 100 feet long and weighed up to 80 tonsmaking it a close second to the current record holder, Argentinosaurus.